Finally I have found a seriously organic New Zealand magazine. It's a very serious read - with much more than gardening on its agenda! There's a strong underlying awareness of health issues, and themes of organic individuals battling the bureaucrats. I'm shamed (as I read the various interesting and informative articles) of my own quasi-organic attitudes. Obviously Organic NZ's crusading zeal reaches into the non-GE debate as well. By now I'm totally shamed. I've never ever written a letter to my local Member of Parliament - it's high time I did. 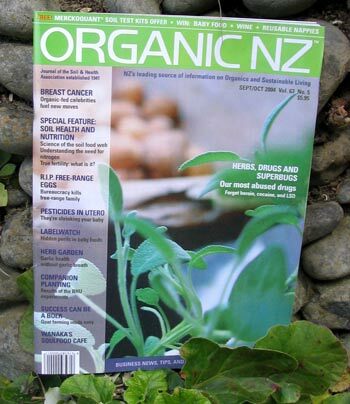 Organic NZ talks about its 'commitment to the land, and to a sustainable and ethical future'. Absolutely! And I resolve never ever to buy non-organically grown broccoli again. If I can't source the organic stuff, I'll do without. This magazine gets a huge recommendation. There's also a website - www.organicnz.org is the address.